So we have this private lake in our neighbourhood. It looks really nice, if I were a dog. 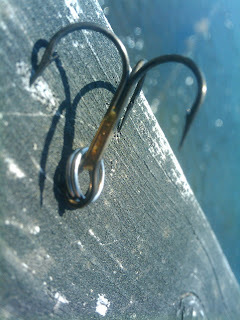 There is a tiny little dock and I put my hand right down on this hook. The hook image was taken with my G1. Sometimes the images it takes really suprises me. This second image was also taken with my G1. The letters were peeled off the back of my HHR. This week I am removing all of the identifing details of it.